This month brings St. Patricks Day on the seventeenth, and with that comes celebrations surrounding Irish traditions. Or American - Irish traditions. 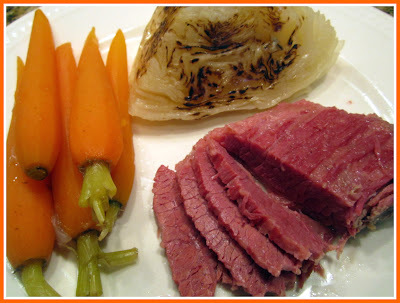 I was eating lunch at Dugan's Pub last week in downtown Little Rock, and I told my friend Christy that I was planning to order the Corned Beef and Cabbage. She said that when she was in Ireland, she never even saw that dish on the menu. Later on, I found out that the dish was not an authentic dish of Ireland, but rather an American - Irish dish. The dish that I had at Dugan's was one of the best that I'd ever had. I immediately decided to make my own. 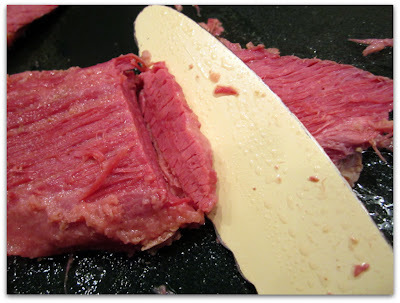 There are two cuts of corned beef: flat cut or point cut. I only saw the flat cut. It comes packaged in brine with a seasoning packet. Put the corned beef brisket into a large, heavy bottomed pan. Cover with water, then turn the heat up to high to bring up to a boil. 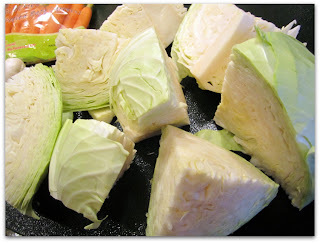 Meanwhile, cut the cabbage into 8 wedges. For an added dimension of flavor, sear the cabbage wedges over high heat in a cast iron skillet. Then set aside to add to the Dutch oven later. Prep the rest of the veggies: baby carrots, white button mushrooms left whole, and an onion that you'll slice. Once the water is boiling, cover with a lid, then turn the heat down to low for about 3 hours (for a 3 pound brisket). 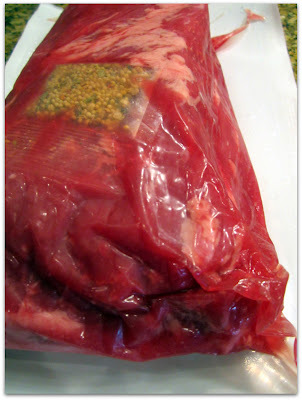 Slice the cooked brisket across the grain in thin slices. This may require turning the brisket to cut at an unusual angle. 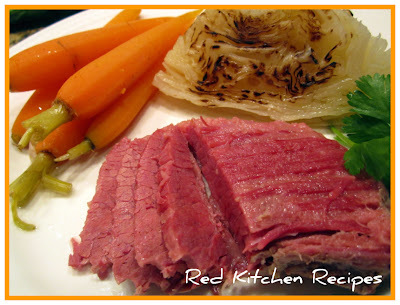 Remove the corned beef from the package and place into the bottom of a Dutch oven. Fill with water to cover. Turn the heat to high until boiling. Once the water boils, turn the heat to low and cover with a lid for 3 hours. 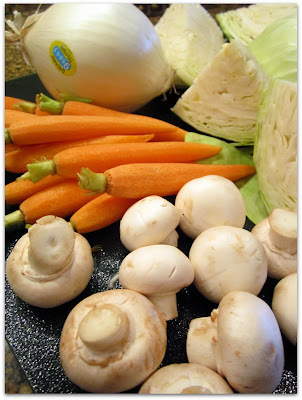 After two hours of cooking, add the mushrooms, baby carrots, the white onion, and the cabbage. Continue cooking. When finished, remove the brisket and slice across the grain. Serve with veggies.